If you’ve played anything from Calliope Games, then you know that they make fun, accessible family games. Today they’ve launched a new game on Kickstarter that looks to continue that tradition, Dicey Peaks. 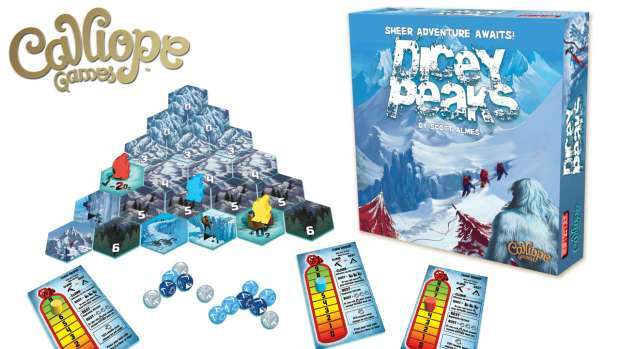 Families seeking a fun and simple-to-play new board game should look no further than Dicey Peaks. “It’s a game that can be enjoyed by the whole family,” says Dicey Peaks designer Scott Almes, “It allows a child to “step up” to the adults’ level, instead of the adult stepping down to a kid’s level.” Dicey Peaks begins players at the base of Yeti Mountain, where they must roll dice and press their luck to be the first to reach the fabled red flag at the top. Along the way, they will flip over tiles to reveal the mountain, allowing exciting moments including avalanches and Yetis. Dicey Peaks can support 2-6 players ages 8 and older, and a typical game lasts less than 40 minutes. “The first time we were introduced to Dicey Peaks, we immediately loved it,” remarks Chris Leder, the Director of Fun™ at Calliope Games. “Every turn you get to make fun choices – when to race ahead and when to play it safe – and those decisions make this an instant favorite game for all ages. There’s real nail-biting moments every game!” Dicey Peaks features artwork by celebrated artist Andrew Hepworth, and includes 13 custom dice, 29 thick gorgeous hexagonal mountain tiles, oxygen player boards, and six colorful climber pawns. Calliope Games is seeking funding on Kickstarter, a crowdfunding platform which allows users to pledge to bring a project to life. Those interested in helping bring Dicey Peaks to life can visit the Kickstarter page (http://kck.st/2nbkc3h) now through April 22, 2017 for more information, and to pledge $26 for a standard edition of the game. A Deluxe edition, including unique cover art, an art book, and a fun Yeti standee, is also available via the Kickstarter page. Shipping is free in the continental United States. Scott Almes is best known for the Tiny Epic series, so he has a large pedigree behind him. Be sure to check out the Kickstarter for more details. You can hardly go wrong for $26.